The ulnar nerve is a branch of the medial cord of the brachial plexus, which travels distally along the medial side of the arm. It passes posteriorly to the medial epicondyle at the elbow, then if follows along the ulna towards the hand. The nerve gives off two sensory branches which supplies sensation to the dorsomedial hand, the 5th digit, and half the 4th digit. 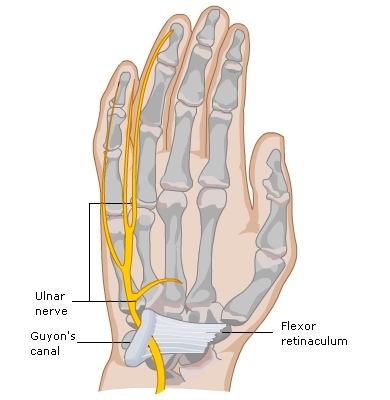 At the wrist, the ulnar nerve enters the hand by passing through Guyon’s Canal. This tight tunnel is formed between the hamate, the pisiform, and the pisohamate ligament which helps keep these carpal bones together. Either within or just beyond Guyon's Canal, the ulnar nerve divides again in two motor branches. In the cyclist, it is at or just before Guyon’s Canal where compressive injury to the ulnar nerve mostly commonly occurs.. It is important to understand the signs and symptoms of this ailment so that it can be identified and proper diagnosed without having to seek numerous tests. Assessment of the person's ability to adduct the thumb should be performed. If weakness is apparent, this could be the result of paralysis of adductor pollicis. Paralysis of the interossei muscles is also possible, and would present as an inability to abduct and adduct all the fingers. To examine, the person places his/her hand on the table and the therapist asks him/her to lift the 3rd finger upwards. The person is then asked to adduct and abduct this finger pertaining to the 4th finger. This is not possible if the person has cyclist’s palsy. In this case, a shift from the flat of the hand and the wrist to the ulnar side would be observed as a compensation. People withe cyclist’s palsy in advanced stages could have a claw hand, in which case surgery is sometimes indicated. Another important question in the differential diagnosis of ulnar nerve entrapment is which part of the ulnar nerve is affected. Compressions of the ulnar nerve at the level of the elbow (i.e. cubital tunnel syndrome) or the neck (i.e. scalenus syndrome) require different treatment. Additional examination is needed to trace the exact place of compression and underpin the diagnosis with more certainty. When comparing the symptoms of cyclist's palsy with cubital tunnel syndrome (which occurs more frequently), a different clinical image is seen. Electrodiagnostic studies can be used to localize the site of nerve compression and to determine the extent of the defect. More specifically, electromyography (EMG) measures the electrical activity of muscles at rest and during contraction, and may reveal degeneration in the nerves supplying a muscle when the patient is suffering from persistent weakness. The EMG has to be performed bilaterally and comparative for both hands. EMG examination will provide all the information that is necessary to make the correct diagnosis and to initiate treatment. In case of nerve compression, EMG examination is often performed in combination with Nerve Conduction Studies (NCS). The latter are used mainly for evaluation of paresthesias (numbness, tingling) and/or weakness of the arms and legs and specifically evaluate the ability of electrical conduction of the motor and sensory nerves of the human body. However, the use of EMG is not absolutely necessary. Other examinations can be performed, such as radiography which will give an image of possible bone damage, a scanner or arthroscanner which will give information about the ligaments and echography which will help to define if there is a cyst or another tumor. Prevention is the most important part in avoiding Cyclist's Palsy, and it can be effectively prevented. Cushioning the pressure points by using padded handlebars and padded cycling gloves is effective. This provides an extra layer or protection to better absorb shock and protect from pressure. The position of the hands on the handlebars is also important. Individual sizing/fitting of the handlebar and riding position is crucial for preventing this condition. The cyclist should regularly change the hand position on bars. Enthusiastic long-distance cyclists should also adopt a comfortable and resilient riding posture. If the trunk musculature gets fatigued, the hands will invariably bear more weight to stabilize him/her on the bike. Developing a better posture on the bike requires strong trunk muscle endurance. To advance the healing process, the physiotherapist can use heat and cold therapy to calm pain and to reduce swelling. Other modalities such as electric stimulation, low level laser, ultrasound and soft tissue techniques will also help to improve the condition. - finger bending exercise: start from a stretched hand, bend your fingers of the affected hand in a right angle and hold for 10 seconds while keeping your fingers straight; repeat 5 times. - finger squeeze: place a small object (e.g. 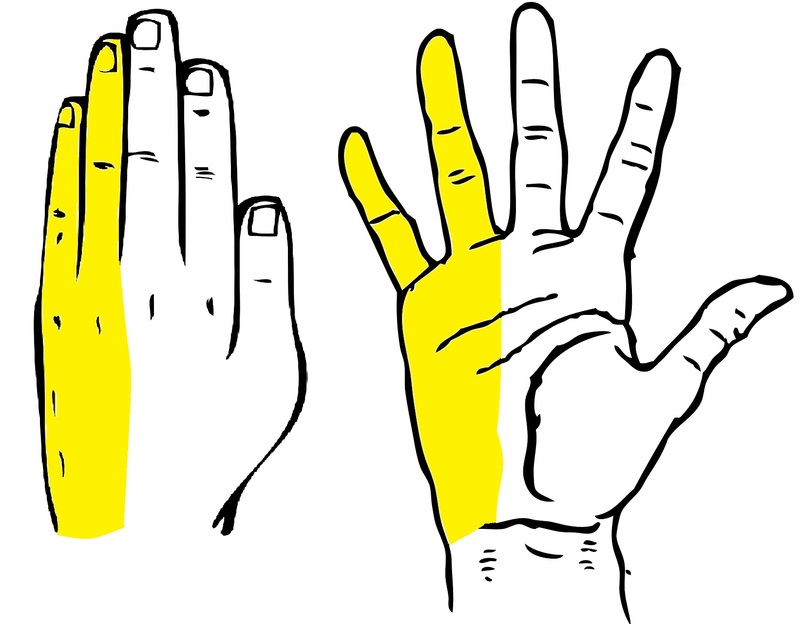 pen, coin, sheet of paper, ...) between 2 fingers of the affected hand and hold for 10 seconds; repeat 5 times for each pair of fingers and then move to the next fingers. Stronger hand muscles will also help to prevent cyclist's palsy from recurring. The patient can also do a number of motion exercises focusing on the entire area where the ulnar nerve lies, from the neck to the hand. These will be beneficial in improving and restoring mobility. - cervical range: rotation of the head, flexion and extension of the neck, and side bending of the neck; hold each position for 10 seconds and then return to neutral position. - scapular range: start from a standing position, pull up your shoulders and keep for 5 seconds, then squeeze the shoulder blades backwards together and hold for 5 seconds and finally pull the shoulder blades down and hold again for 5 seconds, then relax; repeat 10 times. - elbow range: start from a standing position, bend your arm at the elbow and bring up the hand towards the shoulder, then straighten again; repeat 10 times. In order to avoid cyclist's palsy or to reduce prevalence of this type of non-traumatic hand and wrist injury during cycling, it is most important to have a look at the prevention strategies. Finally, the cyclist should make sure to ride on the right size of bicycle and to adapt the position of the saddle and handlebar to make sure that these allow to sit on the bike in a normal position. The following adjustable variables of the bike set-up should be reviewed carefully and adapted in function of the body size and shape of the individual cyclist. This will prevent many overuse injuries during cycling. While standing astride the frame of the bike, there should be a 2.5 to 5 cm clearance between the top tube and the cyclist's crotch. For a mountain biker, this will be a bit more. Upon buying a new bike, the correct frame size can be calculated by multiplying the inseam from floor to crotch with a factor, depending on the type of bike the cyclist wants to buy: mountain bike, racing bike, city bike. Also the crank length should be checked. The crank should be 21% of the length of the inseam. The saddle height should be set so that the knee angle of the extended leg remains flexed to approximately 25 to 30 degrees when the pedal is at 6 o'clock position. If the saddle is too low, this will increase the risk of anterior knee pain because of the pressure that goes through the knee increases. Also back pain can be a consequence. The saddle top surface should be set level. If the saddle tilts more forward, this will transfer the body's weight onto the hands and arms. If the saddle tilts more backwards, this will increase the flexion at the lumbar spine and also the pressure on the groin. To determine the correct saddle position, sit on the bike and place the feet on the pedals. Place the pedals in the 3 and 9 o'clock position. The saddle is correctly positioned when the tibial tuberosity of the leg in front position is 1 cm behind the pedal axle. If the saddle is set too far forward, this will increase the load on the knee cap, with a risk of over-use injury and reduction in overall leg efficiency. The handlebar should be placed 2.5 to 5 cm below the top of the saddle. For a recreational cyclist, the position will be somewhat higher. If the handlebar is too low, the posture will be more aerodynamic, but this will increase the weight of the upper body on the wrists on the handlebars. The handlebar should be as wide as the shoulders. This ensures a good chest expansion and breathing. A narrower handlebar with bar extensions will give you a greater variety of comfortable hand positions. If the handlebar is too wide, this will give more stable control (e.g. for mountainbike rides), but will become uncomfortable during longer rides. The handlebar has the right distance when the finger can touch the transverse part of the handlebar if the elbow is placed on the tip of the saddle. If the handlebar is too far away, this will increase muscle tension in shoulders and neck and will result in neck pain, headache and shoulder tension. If the handlebar is too close, this will place the spine into a flexed position and will put a greater strain on the lower back, upper back and neck. ↑ Marieb EN, Wilhelm PB, Mallatt JB. Human Anatomy. 7th ed. San Francisco: Pearson; 2012.